I have this thing I do when I’m not sure how to respond: I involuntarily freeze stone-faced for a few seconds, thus allowing my brain to work. It’s what happened after my friend’s remark. All kinds of thoughts whipped through my head, as I stood there motionless, considering what to say next: Wait, I’ve spent at least that long on my book! What does that mean? Is it really crazy to do that? Am I crazy? Have I wasted my life? Does the fact that my book took me so long to write mean that I’m a bad writer? It was a bit of a white lie. Truth is, it actually took me longer. I doubt that anyone who picks up Epistolophilia will guess that it was twelve years in the making. For one thing, it’s not even a particularly long book. But even though I didn’t write consistently for twelve years, and accomplished a lot of other stuff during that period, from the first discovery of Ona Šimaitė’s story to the appearance of the book, that’s the amount of time that elapsed. There are many reasons why it took so long to complete. First, I had to gather research materials from five archives in three far-flung countries. Once I’d collected these, I had thousands of manuscript pages to sift through. What’s more, to read a large portion of these documents, I had to remember how to read Russian (a skill I hadn’t used for some ten years). When I actually started writing, I made some false starts and took some wrong turns. Finally, I had a baby. That slowed things down even more. Had I known then what I know now, I could have saved myself a few years. But I didn’t, so I couldn’t. Live and learn. Write and get better at it. How long should a book take to write? My answer: as long as it takes. 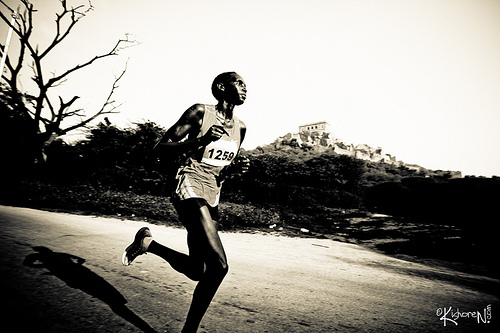 Writing, in large part, is an endurance test. The creation of a book is a marathon, not a sprint, so one of the most valuable traits a writer can cultivate is patience – with herself, with the industry, and with the creative process. Some writers work incredibly quickly. I applaud them and, truth be told, am slightly envious of them. But if you’re like me, and write at a snail’s pace, that’s OK too. Make peace with your natural pace and rhythms, whatever they are. That’s how the best work happens. Beth Kaplan, Finding the Jewish Shakespeare: The Life and Legacy of Jacob Gordin. 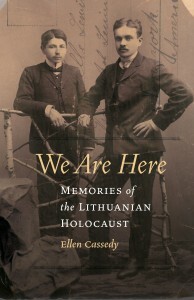 Syracuse University Press, 2007 (Paperback 2012). Born of an Anglican mother and a Jewish father who disdained religion, Kaplan knew little of her Judaic roots and less about her famed great-grandfather until beginning her research, more than twenty years ago. 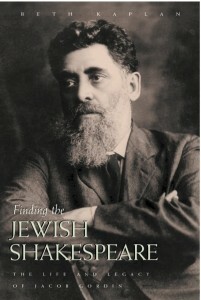 Shedding new light on Gordin and his world, Kaplan describes the commune he founded and led in Russia, his meteoric rise among Jewish New York’s literati, the birth of such masterworks as Mirele Efros and The Jewish King Lear, and his seething feud with Abraham Cahan, powerful editor of the Daily Forward. Writing in a graceful and engaging style, she recaptures the Golden Age and colourful actors of Yiddish Theater from 1891 to 1910. Most significantly she discovers the emotional truth about the man himself, a tireless reformer who left a vital legacy to the theater and Jewish life worldwide. Beth Kaplan is a writer and actress in Canada. She has taught memoir writing at Ryerson University for sixteen years and at the University of Toronto for five. 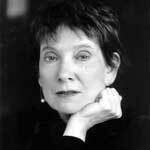 Her essays have appeared in the Globe and Mail and other newspapers and magazines. Visit Beth Kaplan’s website at www.BethKaplan.ca. 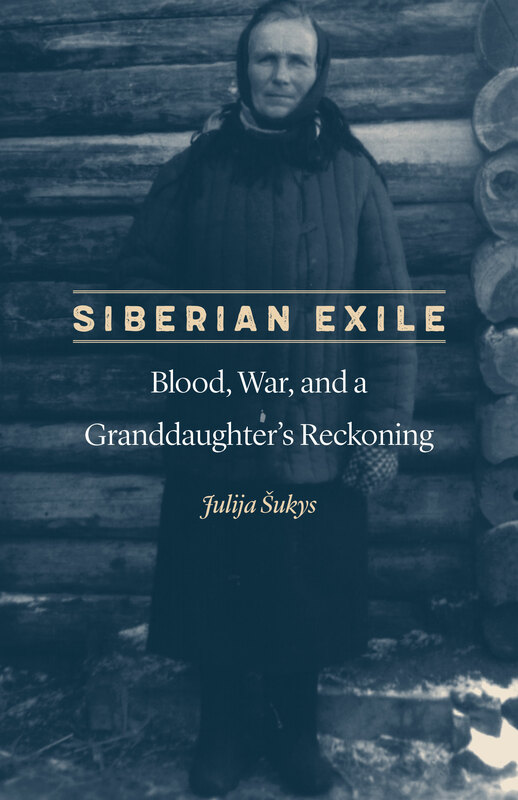 Julija Šukys: In your bio in the opening pages of the book, we read that you spent twenty years raising children and writing this book – “they both left home together.” My writing became entangled with and inextricable from my private life once my son was born four years ago. In light of the connection you draw between your kids and the process of writing, I’m interested to know more about the relation between them. Beth Kaplan: I had my first child in Vancouver when I was nearly 31. I’d been working as an actress in Vancouver for eight years; when I got pregnant, I left the stage and registered to take an MFA in Creative Writing at UBC. So it was as if pregnancy gave me permission to finally sit down and write. And then the birth of my daughter took that permission away – or at least, made the process difficult. I adored being a mother and didn’t know how to focus on anything else. I’d take the baby to a YMCA daycare for a few hours every few days, so that I could write – but often instead I’d grocery shop or sleep or read the newspaper, things I couldn’t do when she was around. And I felt alone. Almost none of my friends in the theatre or at UBC had kids, and I didn’t know, or even know of, any mother writers. Someone said once that of the 3 things of vital importance to a married woman – husband, children, work – she could only successfully have two of the three. I thought about Virginia Woolf with husband and work, Margaret Laurence with children and work, L. M. Montgomery with all 3 and a wretched life. There were very few examples of a writer with all 3 successfully. Later I discovered Carol Shields as one very good example, and there are now lots. But around me in the eighties, there were few. I wrestled with that constantly. I managed to finish the degree long-distance – we moved to Ottawa for my husband’s work in 1983 where I had my son, and then to Toronto in 1985, where I finished my thesis on my great-grandfather and decided to keep going with research and to write a book. When my kids were 6 and 9, my husband and I separated, he moved shortly after that to the States, and so I was a single mother with financial support from him but 100% custody of two difficult children and an old, disintegrating house, in a city where I had no work connections and no family. The result – the book wasn’t published until 2007. I don’t blame that solely on being a single mother. I also completely lost confidence in myself, was isolated with no support group, had no idea what I was doing – in academic research, there are methods, I just didn’t know what they were. I compared the book to an octopus with its tentacles around my neck – the minute I pried one away, another had me in its grip. And that’s just the writing, let alone getting the thing published. It’s a miracle it ever appeared, in fact. So this is a very long answer to your question, which is – that I came too late to understand something I call beneficial selfishness. I think writers, artists, have to be selfish sometimes, even with their children. That is, not selfish to the point that their needs are neglected. But selfish in asking them to recognize that their mother has important work that requires something of them. Writing is so invisible. If I were playing the cello or painting, they could hear or see that. But they could see nothing of my work. That was hard for me too, as most of the time, I didn’t believe either, with very little published, that I was a writer. What helped was writing essays for the CBC and newspapers and for “Facts and Arguments” in the Globe and Mail – I published a lot of short term things that got me out there, got my name in print and showed the world, and me, that I was a writer. Incidentally, many of my essays were about my kids. They grew up being chronicled on the back page of the Globe – always with veto power, of course. But they liked it. 25 years later, I’m still in the same house; the kids live on the other side of town and their rooms here are rented out to help pay the mortgage. I teach but have lots of time, lots of quiet for writing, which is heaven. Except that my daughter has just told me she’s pregnant. Omigod, I’m going to be a grandmother. I can’t wait. But this time, I’ll be able to cuddle and hug and read stories, and then give the baby back and get on with my work. The fact is that unless you have a spouse who can take over, which I did not, young kids do and must come first, especially when they’re very young (and again when they’re teens but that’s another story.) But that doesn’t mean shelving the work. It means being creative with finding time, and it means taking it and yourself seriously enough to be selfish, sometimes. Otherwise, the work is constantly last, and the book takes 25 years to emerge. Finding the Jewish Shakespeare constitutes a kind of textual archaeology. It tells the story of your great-grandfather, Jacob Gordin, a Yiddish playwright once compared to Shakespeare and Ibsen, now largely relegated to oblivion. Tell me about the impetus to embark on such a journey, and the research path down which it took you. I needed to choose a thesis subject for my MFA, and it was my husband who said, You have a great man in your family, write about him. Once he’d said it, of course, I knew that was exactly what I wanted to do. Because there was the mystery I’d grown up with – why did my father and other relatives have such disdain for a man who’d been in his time so revered? So I blithely began, without realizing that almost all my research materials were in New York City– this was 1982, the Dark Ages before Google, so research meant writing letters, making phone calls, and getting on airplanes. The first time I flew from Vancouver to New York for research in 1983, the thrill of arriving at the YIVO Center for Jewish Research on 5th Avenue, asking for their materials about Gordin, and watching the cart rumble up to my desk with all those file boxes. Then opening them eagerly, and finding that nearly everything was in Yiddish or in archaic Russian – the next tiny hurdle, as I spoke and read neither. I was lucky enough to find a woman who translated from the Yiddish for me for 25 years. So it’s really our book, Sarah Torchinsky’s and mine. I wrote lots of letters of enquiry, discovered family members to interview – several of them just in time, as they were extremely old already when I found them – and read everything I could find on or around the subject. I didn’t start using a computer for writing until 1987 or so. And Google, of course, much after that. It seems unbelievable now, how much time research took. And several people have pointed out that in the Internet age, we lose the thrill of hunting and holding the actual artifacts and books. As I read your book, I found myself continually pondering questions of language. Interestingly, Jacob Gordin’s strongest language, and the language he appears to have loved best, was Russian. Yet, he wrote his plays in Yiddish, a language that always represented a bit of a struggle to him. It’s not the language he used in private: with his wife he spoke Russian, and to his children, English (a language it appears he never mastered). Why, once he had gained some success, do you believe that Gordin never made the switch to Russian? Why did he continue to write in Yiddish, despite the limited audiences, the community politics that you describe, and despite the fact that it was not the language in which he planned his plays? Gordin didn’t switch to Russian because nobody on the Lower East Side ever wanted to hear Russian again; he would have had no audience at all. Yiddish was the language of mothers, of home, hence not only of the theatres but of the burgeoning Yiddish newspapers. Russian was the tongue of the oppressor, the Cossack enemy, there was no place for it amongst the Jews in America. But Gordin always dreamed of going back to Russia one day. Before he died, he knew that his plays were touring Russia – one of his sisters, who still lived there, wrote to him from her town in Ukraine of her pride in going to the theatre to see two of her brother’s plays. But she saw them in Yiddish, not in Russian. There were Yiddish theatres and troupes performing Gordin’s plays in South America and in Eastern Europe – in fact, all over the world. This is Part I of a two-part interview. Click here to read Part II. 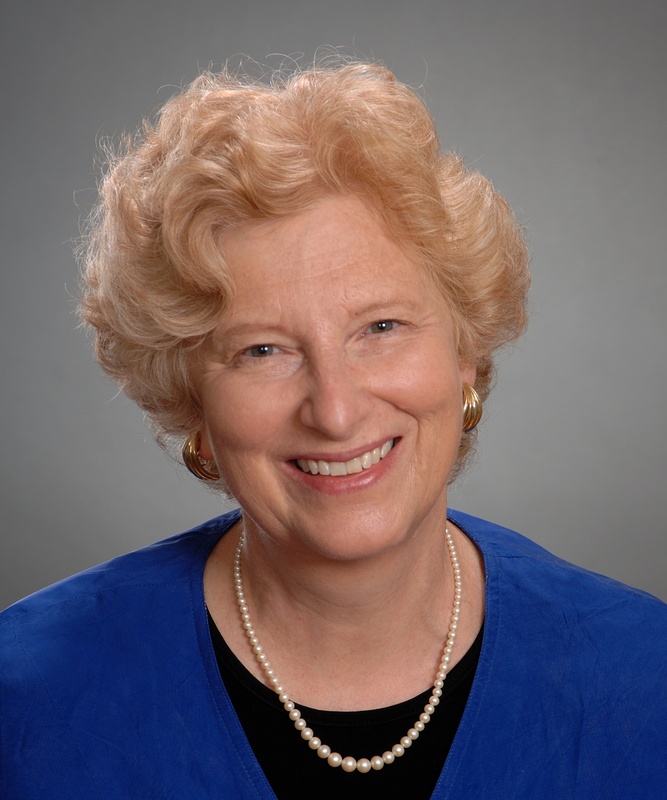 This is Part II of a two-part interview with Beth Kaplan about her book, Finding the Jewish Shakespeare. Click here to read Part I.
Julija Šukys: My second question about language is about your relationship to the various tongues at work in this book. What is your relationship to Yiddish and Russian, the languages of your ancestor? Given the decline of Yiddish since World War II, there’s a real sense of loss that surrounds that language these days. Does this sense of loss come into play in your relationship to Gordin’s texts and history at all? Beth Kaplan: Well, this is a very profound question because it also goes to the heart of my hybrid status – as a half-Jew delving into this very Jewish story. Several people, hearing of my work, told me I should learn Yiddish first. A Yiddish academic, who continued to be extraordinarily unhelpful, told me when I called to introduce myself at the beginning that writing a book about Gordin without speaking Yiddish was like writing about Moliere without learning French. As if my family connection were meaningless. I had no interest in learning Yiddish, though I did take a term of Yiddish classes through the Toronto school board, where my suspicions were confirmed – the class was filled with people wanting to reconnect with memories of their childhoods, especially of their grandparents. I had no such desire. In fact, my grandmother, Gordin’s daughter, spoke no Yiddish and had no interest in it. That’s the irony at the core of all this, as you noted – Gordin, revered as a Yiddish playwright, spoke Russian or English at home and hadn’t much respect for the language of his great success. I did take Russian lessons, incidentally, which interested me much more because it’s the language of a country I could actually go and visit. So it was thanks to my dear Sarah Torchinsky that the Yiddish documents revealed their secrets to me. My father, whose relationship with his own Jewishness was conflicted, as I point out in the book, loved Yiddish phrases and expressions and used them often, but he would have been horrified at the thought of actually learning to speak the language. Intellectuals like him thought of Yiddish, not as a vibrant language in its own right, but as a kind of hybrid, debased German. I respect and admire those trying to keep Yiddish alive, especially the amazing Aaron Lansky of the National Yiddish Book Centre in Amherst. Right now, I am corresponding with a woman living in rural Texas, who speaks Yiddish in complete isolation and is translating one of Gordin’s plays. But the future of the Yiddish language is simply not my cause. Although your portrait of Gordin is nuanced (you don’t hold him up as the best playwright who ever lived, nor do you sugarcoat difficult aspects of his personality like his ego), the book nevertheless reads as a project of rehabilitation. 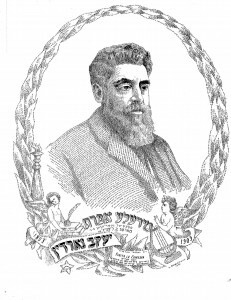 Gordin’s legacy has suffered terribly from a vicious campaign waged by the New York Yiddish literary critic, Abraham Cahan. Talk a little bit about the conflict between Gordin and Cahan. How much did you know about it when you began researching? What, in your opinion, lay at the heart of Cahan’s fervour in destroying his rival so thoroughly? 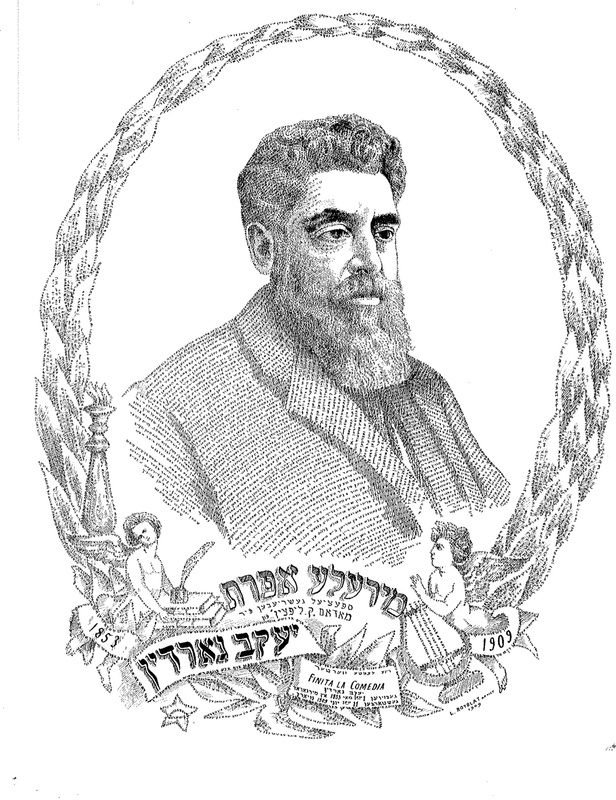 Abraham Cahan was a critic at the Jewish Daily Forward. The more I learned about his vindictive personality and especially his campaign against my ancestor, the more I felt that if nothing else, this book would defend Gordin and expose what he endured. I learned that Cahan pursued several other vicious vendettas, one against the writer Sholem Asch even more single-mindedly destructive than the one against Gordin. I posit in my book that there was something about Gordin’s largesse, huge family (eleven children) and enormous popularity that goaded Cahan, who was the opposite in nature, an anti-social man with very few friends, no children and an unhappy marriage, who lived not in a home but in a hotel. So the surface of their battle may have been political – they disagreed vehemently on how Jews should be helped to adapt to their new land – but I think with a burning personal base. When I found some of Cahan’s articles against Gordin and had them translated by Sarah, they broke my heart – they were so petty and cruel. Not without an occasional point, certainly – but far, far beyond the boundaries of criticism. They attacked everything about Gordin with a kind of nasty glee with made me, literally, feel ill.
You describe finding a number of Cahan’s assessments of Gordin’s work almost verbatim in current descriptions of his work, namely that his plays have little literary merit. To me (and I think to you), it is this question of tainted legacy (that of Gordin as a hack, and even, as you describe, of a plagiarist) that is the greatest tragedy of this story. What does Gordin’s story tell us about the capricious nature of literary legacy, or of how writers are made and destroyed? I made a lot of the tragedy of Gordin’s humiliation by Cahan, because I did come to feel that Cahan had left an accusatory legacy of plagiarism that my father absorbed. But in the end, I have to point out that many people did remember and respect Gordin – that Cahan’s campaign wasn’t completely successful. After all, a quarter of a million people, apparently, packed the streets the day of his funeral. I think that Gordin was more a newspaperman or a teacher than a playwright, in that he was so didactic, always preaching his message. But an elderly Yiddish actor I spoke with from Britain told me his plays were spectacular vehicles for actors. I had to keep in mind how much the theatre itself has changed; that many of the most successful playwrights of a particular time vanish pretty quickly. Our list of great playwrights of other times is much smaller than the list simply of great writers; it’s hard to write a play that is relevant to its time but will also endure. Gordin was a marvel for his time and place, bringing theatre with dignity and finesse to a people who’d had no theatre at all only decades before and who only knew a kind of vaudeville of melodramas and operettas. He accomplished a great deal, but he was no Ibsen. Most of my own contact with the Yiddish literary scene has been through my research on Vilna. I was amazed to learn of the vibrant Yiddish scene that Gordin was a part of New York at the turn of the century. Do you see echoes of that theatrical and, in some ways, revolutionary world? Or is it really gone for good? I describe in the book the scene in the 1800s in New York, when factions supporting rival actors playing Macbeth began to fight each other in the streets, resulting in a number of deaths. If only audiences cared so much today about the theatre! But today when people are sitting at home in front of a thousand different screens, we can’t reproduce that time, when sitting in a theatre meant so much, gave people a taste of home, let them hear their past, their homeland… It was an incredibly vibrant time, when New York was flooded with immigrants, desperate to learn and prosper. In a startlingly short time, many of them did. This is a book not only about your great-grandfather, but also about your extended family, and about you. It’s about your hybrid identity (half-gentile, half-Jewish). It’s about the family silence surrounding the one great, but somehow shameful family member. It’s about the discovery of roots, and the drawing of a line back to the other writer in the clan. How important to this story is the fact that you are Gordin’s great-granddaughter? Talk a little about the decision to write a book that was a work of creative nonfiction, infused with the writerly gaze and experience, rather than a “straight” biography. I had a big technical problem writing the book, which was never really resolved – that it was, in fact, two books. The first was the scholarly Gordin biography that was needed because there wasn’t one – detailing the history of the man and his plays. The other book, the one that really interested me, was the family story and my connection to him and to his life. I got trapped in the biography, loaded down with facts and names and dates, and then did my best to bring life to all that with the personal stories. The problem was that the resulting manuscript was too weighty and scholarly for the mainstream publishers, where my New York agent first sent the book, and too personal and informal for the university presses, which wanted a dry biography with footnotes and no personal material. Footnotes! I’d been doing research for over 20 years, most of them as a single mother in chaos, I had paper stuffed into boxes all over my house with no idea where I’d found this quote or that bit of play, and no desire to spend years digging it all back up. I said no footnotes, which meant most university presses were not interested. Luckily, Syracuse was happy to take the manuscript and turned out a beautiful book, though I had to cut some of the personal stuff. If I had to do it again, I might try to actually do two books – one for the university Yiddish departments, with just cold facts, and another with far fewer facts but more heart and soul about the family. A wealthy friend of mine, after reading the book, said, “Too much detail. Why didn’t you turn it into fiction? That would have been more fun and would have sold much better.” That may be true. But I have not the remotest interest in taking a fabulously interesting true story and fictionalizing it, inventing characters and situations when I’d hunted for decades to uncover the real ones. My friend Wayson Choy has written two novels and two memoirs; I admire that kind of ambidextrousness, switching between fiction and faction. I have no interest in even trying. Give me a true story, any day. Janina Degutytė. Poezija/Poems. Trans. M.G. Slavėnas. Lithuanian Writers’ Union, Vilnius, 2003. I’ve been thinking about the issue of obscurity lately, because I’ve wanted to write about a book that’s been sitting on my desk for months now. It’s an English translation of the work of a Lithuanian poet, Janina Degutytė (1928-1990). She wrote her best verse during the Soviet years, and lived openly as a gay woman in a time and place when this was unheard of. She died shortly before her country regained its independence. My colleague and friend, Mary Gražina Slavėnas published the translations of Degutytė’s poems in 2003. Her book is a labour of love if there ever was one, for can it get much more obscure than Degutytė? What is the significance of the work that Slavėnas put into ensuring that a trace of that oh-so-talented but ever-so-obscure poet remained in a language that was not her own, I wonder. It’s somehow defiant as a gesture — the translator thumbing her nose at obscurity. I came across Degutytė in my work on Epistolophilia. 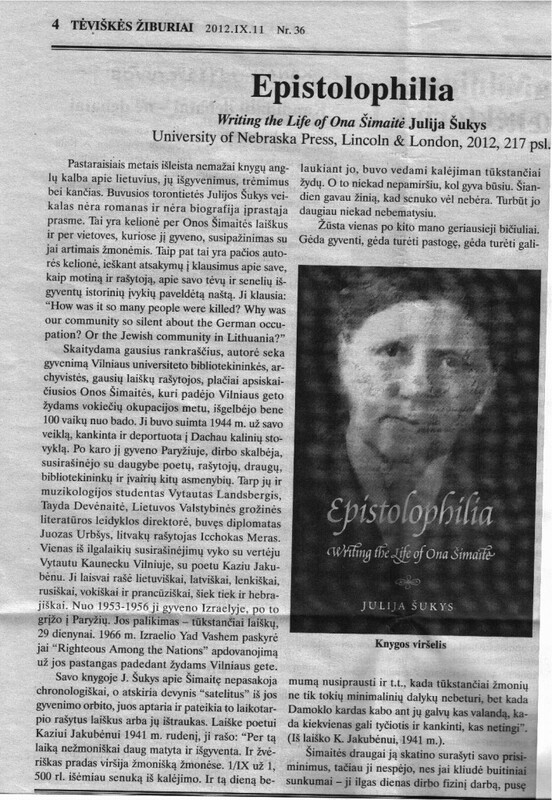 The (obscure-in-her-own-right) librarian about whom I wrote my second book used to send much-needed heart medication from Paris to the Vilnius poet. In doing so, Ona Šimaitė may have saved Degutytė’s life, and gave her many years of productivity. In a way, my historian friend was right. If I have a vocation, it is this: to gather and preserve traces of lives the memories of which I feel are worth saving. Though I see the value of writing books about Shakespeare, Beauvoir, Pushkin, and other iconic figures, this is not my calling (or at least it hasn’t yet been). For me, there’s something thrilling and even weighty about publishing the first real account of someone’s life. But is there still room for the obscure, unknown and hopelessly uncommercial? Our industry is changing, and it somehow seems easier and simultaneously, paradoxically more difficult to publish than ever before. As much as I can, I try to ignore the building anxiety surrounding book production, and concentrate on the work of writing. Amidst all the noise, I continue to try and take the long view. I remind myself that libraries, at least, are eternal. In my way, I build portraits with words, memorials with paper, and memories with imagination. Even if my work might find but a few readers today, I tell myself that a trace will always remain in the stacks of great book repositories. And most days, this is enough to keep me going. But lately, with library closures and increasing percentages of library budgets going to electronic resources, I have started to wonder if this long view is naïve. Can we continue write for the stacks? Who will ensure the safeguarding of important (though rarely commercial) works? The discussions I hear in the media and among writers vacillate between euphoria (anyone can publish now!) and despair (anyone can publish now…). Can a writer like Degutytė (or like me, for that matter) hope to be noticed in this climate? to keep people safe and warm. I would also like to build. 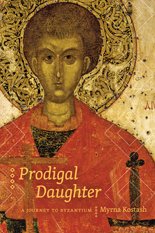 Myrna Kostash, Prodigal Daughter: A Journey to Byzantium. Edmonton: University of Alberta Press, 2010. Born and raised in Edmonton, Alberta, Myrna Kostash is a fulltime writer, author of All of Baba’s Children (1978); Long Way From Home: The Story of the Sixties Generation in Canada (1980); No Kidding: Inside the World of Teenage Girls (1987); Bloodlines: A Journey Into Eastern Europe (1993); The Doomed Bridegroom: A Memoir (1997); The Next Canada: Looking for the Future Nation (2000); Reading the River: A Traveller’s Companion to the North Saskatchewan River (2005); The Frog Lake Reader (2009); and most recently, Prodigal Daughter: A Journey into Byzantium (2010). In 2008 the Writers’ Guild of Alberta presented Kostash with the Golden Pen Award for lifetime achievement. In 2009 she was inducted into the City of Edmonton’s Cultural Hall of Fame, and in 2010, the Writers’ Trust of Canada awarded her the Matt Cohen Award for a Life of Writing. A deep-seated questioning of her inherited religion resurfaces when Myrna Kostash chances upon the icon of St. Demetrius of Thessalonica. A historical, cultural and spiritual odyssey that begins in Edmonton, ranges around the Balkans, and plunges into a renewed vision of Byzantium in search of the Great Saint of the East delivers the author to an unexpected place—the threshold of her childhood church. An epic work of travel memoir, Prodigal Daughter sings with immediacy and depth, rewarding readers with a profound sense of an adventure they have lived. Prodigal Daughter has been awarded the 2011 City of Edmonton Book Prize and the 2011 Writers Guild of Alberta Wilfred Eggleston Prize for Nonfiction. Julija Šukys: Like all good texts of creative nonfiction, Prodigal Daughter is a hybrid text. It’s part travelogue, part historical exploration, and partly a narrative of a personal and spiritual journey. The unifying thread and the organizing metaphor (if that’s not wrong way to think about him) is Saint Demetrius. He’s a complex figure who is appropriated and venerated by a number of cultures and historical narratives. Can you talk a little bit about how Saint Demetrius came to be at the centre of this book for you? Myrna Kostash: There are 2 versions of this “origin” narrative: the one in the book and the one that is the more truthful story, which out of discretion I have not used. But the published version is close enough: in search of an entry point into a book about Byzantium that I had wanted for years to write, I came across the figure of a saint venerated in the Orthodox Church whose story as told by the Church was exactly the perfect “hook” for me. St Demetrius, according to the hagiography, was martyred in the northern Greek city, Thessalonica, in 304, for the crime of professing faith in Jesus Christ. A couple of centuries later, however, he reappeared in the form of a saint working various miracles in defense of his beloved city, Thessalonica, which was under sustained attack and siege by barbarian marauders. Historically, these barbarians were Avars and Slavs from beyond the Danube, and they never did succeed in taking the city, although they settled in the region, Macedonia. It was this coherence of Slavic ethnicity and the Orthodox spirituality of Byzantium (I was baptised into the Ukrainian Orthodox Church of Canada as an infant) that inspired me to begin this book’s journey: I had a subject. What did Saint Demetrius stand for when you began the journey of Prodigal Daughter, and what does he stand for now that you’ve come to the end of this particular chapter of writing and life? In part, this book is about your somewhat reluctant return to your childhood roots in the Ukrainian Orthodox Church. You’re a feminist, a leftist, and a humanist. All this makes for a fraught relationship with your childhood church, so you naturally moved away from it as a young adult. After what you describe as a number of failures of the core ideologies of your youth (the Left, student radicalism, even feminism), you recently found yourself yearning for something else: new meaning and a sense of the sacred. Can you talk about this path back to Orthodoxy? How did your journey across greater Macedonia and the history of Byzantium help repave an old path differently for you? I certainly had no spiritual intention for this journey. As with all my previous books, I was initially motivated by intense curiosity about history, and, in the case of Prodigal Daughter, by all the narratives – stories – that have been told about Byzantium, the Balkans and Eastern Christianity, all of which form a kind of cultural grammar for me (and which for most other people, I imagine, represent a triple whammy of exoticism if not downright weirdness). But even so I admit that on previous travels through the region I was always drawn to Orthodox churches as spaces of genuine repose and reflection. Even socialist feminists need that! Perhaps it was just the familiarity of them that drew me in; I certainly wasn’t very interested at that point in the content as opposed to the form of the life of worship they embodied. But, when it came time to write the book, I realized that, if I were to understand the Byzantine world in which St Demetrius came to be venerated, I had better reacquaint myself with the closest representation of that world in our own time, namely the Orthodox Church. I was living in Saskatoon at the time, as writer-in-residence at the public library, and so I decided to go to a Ukrainian Orthodox church there, to Sunday services on a regular basis. There was much I had forgotten about the forms of worship and much that I never had known or understood (in my childhood in the 1950s the services were entirely in Ukrainian, a language I barely spoke), so I began to read seriously about the history and theology of the Church. For the first time in my life, I read the New Testament, in the form of the Orthodox Study Bible, had a host of questions about what I was reading, and sought the conversation and counsel of a Ukrainian Catholic, Byzantine rite, priest and theologian at the University. He was absolutely brilliant – a deeply consoling mixture of intellectual erudition and spiritual intuition – through whom I became aware of and was prepared to acknowledge something which I mention only glancingly in my book, a deep yearning for the Divine. Of course, this journey back into Christianity would not have succeeded had I not been convinced, and remain convinced, that there is no contradiction between the core and enduring values of (socialist feminist) humanism and those of the basic Christian teachings. The elaborate mysticism of Orthodox theology is something else, however. I’m still on that journey. One of the purposes of this book, it seems to me, is to shed light on an ignored and forgotten era: the 1000-year history of Byzantium. Prodigal Daughter is an attempt to engage seriously with the Balkans, a place that still today is so often dismissed as backward, laughable and even murderous. What was the impetus to fix your attention on that time and place? When I was travelling around eastern and south-eastern Europe in the 1980s and early 1990s (for my books Bloodlines and The Doomed Bridegroom), I became aware of a persistent mythology about “where Europe ends.” Wherever I was – Athens, Zagreb, Ljubljana, Prague, Cracow, Warsaw – people locally insisted that where they were was precisely where Europe “ends.” Which is to say that, where it ends, “Asia” begins. “Asia” signified Turkey in some cases but mostly it signified the Europe that was Orthodox, used the Cyrillic language, had been included in the Ottoman or Czarist Empires, had fallen within the Soviet bloc of countries, had been inflamed by “ancient communal hatreds” well into the 20th century, or some combination of these. What struck me most was that, first, my relatives who still live in Ukraine were thus “outside” Europe, apparently, and, second, that a large part of the territory “outside” Europe had fallen historically within the borders of Byzantium or been contiguous with it. I was incensed. How was it possible that such disdain and ignorance could be expressed about a thousand-year Empire of astonishing political, cultural and spiritual achievement? (By the way, Byzantines never called themselves such – the term was first applied by a Renaissance German scholar – but named themselves Romans right to the end, as successors to the Late Roman Empire. The city of Rome “fell” in 476 to a Germanic army but the Roman Empire just kept on going, from its new capital of Constantinople, until its defeat in 1453 to the Ottomans.) So began my project to bring into view through a work of literary nonfiction at least some aspects of this world of European otherness. It’s interesting (actually, maddening) that the first publisher I approached with a proposal to write under the working title Demetrius: Seduction by a Saint, turned it down on the grounds that “we’ve never heard of St Demetrius and we don’t care; write about St Francis.” Of course this did force me to think about how I would make anyone care about St Demetrius – by making the reader care about the narrator, that is me, as it turned out – but I admit that if I read about one more narrative of a pilgrimage to Santiago de Compostello, I’m going to scream. This is Part one of a two-part interview. Click here to read Part II. I just got off the phone with a translator friend who is in town for a Yiddish festival. Helen has been working on a book-length translation of an important piece of Yiddish creative nonfiction. Since she’s embarking on the publishing process for the first time, she calls me on her visits and we talk about publishing, editing, and the creative process. Because of the specificity of the Yiddish world she’s presenting in translation, and the weird and wonderful details she comes across every time she researches a piece of its history, Helen’s been struggling to limit her footnotes on the text to the essentials. (I can understand this, because, like her, I too am fascinated by details like how a famous literary editor loses his legs in a streetcar accident, even if it’s completely irrelevant). She told me with a sigh that she’s done a lot of unnecessary writing, and now is cutting with a kind of ferocity, trying to get the down to something more manageable. I can’t remember who said it (maybe every writer there ever was), but it seems true to me that starting a new book is like learning to be a writer all over again. Every book is hard to write, because each time a writer is confronted with a new reality and a new set of challenges that the last book didn’t prepare her for. Second novels in particular are notoriously hard to write, because the first is often a life’s work, with the writer’s heart, soul and entire existence poured into it. Tanks empty, a second book can be hard to summon. Maybe, for this reason, second books are the real test of a writer’s mettle. Five years ago or so, embarking on my second book in earnest, I said the exact same thing as Helen: “This time, it’ll be easy.” How wrong I was. Epistolophilia is certainly the best thing I’ve ever written, but also the hardest to write. Of course, we learn from our past experiences. We learn discipline and research methods and editing techniques. In some ways, I’m sure the next project will be easier for Helen. And of course she has to go into it with a feeling of hope and optimism rather than wincing with dread. Otherwise, why would she ever start? Why would anyone?